Isn’t this a beauty? But guess what. This Caramel Apple Cake is even more delicious than beautiful. So it’s not just a cake what is nice to look at it. It is a flavor explosion. 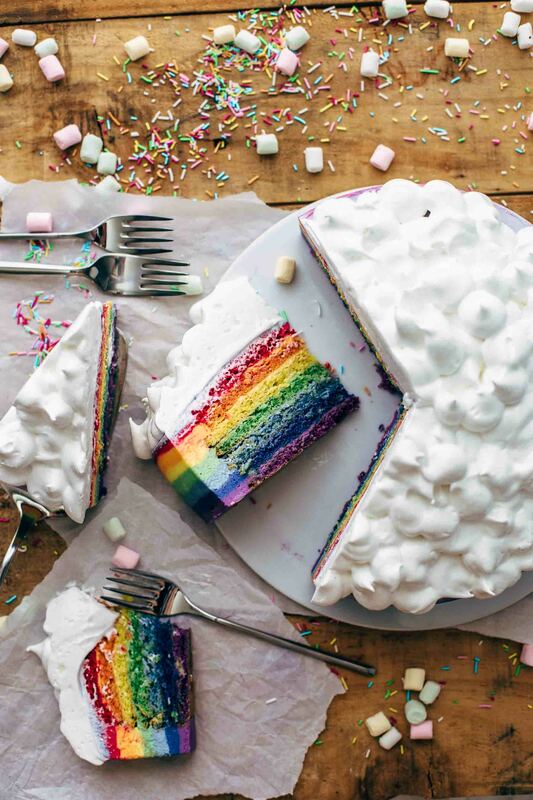 AND, this cake well deserves its name. We have moist and soft apple cake and a cinnamon apple filling. So two times apples. Check. Then a caramel buttercream and a caramel sauce for the topping. Also two times caramel. Check. And I couldn’t help myself but placing a caramel apple on top of the cake. That’s the wow effect. You know what I’m saying? The cake is beyond delicious, and the caramel apple on top is for the eye. But that doesn’t mean that the apple doesn’t deserve to be eaten. In fact, you will have to play with the others, who get it. And the caramel apple brings a third-time caramel and apple into the game. Check. And check. I know to start with the caramel sauce is like working from back to forth because the caramel sauce is the topping. But it takes a while until it is cooled down. I recommend making it the day before and let it stand overnight. So yes, we start with the caramel sauce. You don’t need to be intimidated to create your own caramel sauce. It’s not that hard as you might think. Actually, it is easy to make. The only challenging part is to get the right thickness of the caramel. It must be thick enough that it doesn’t run down the cake and on the table. It should drip. And cooking it too long leads to a very thick consistency that the caramel is not pourable anymore. So both, too thin and too thick, is bad. I cooked my caramel about 10 minutes until it had the right consistency. It thickens when it cools. Towards the end of the cooking time, test the consistency by taking a spoon and dip it into the caramel. As long as the back of the spoon is not coated, it is still too liquid. Once it starts coating the back of the spoon, test the caramel down the sides of the saucepan. It should drip. In case of doubt stop at this point. Remove caramel from the heat and let it stand until it cooled down to lukewarm. This takes about an hour. Then test the caramel again down the sides of the saucepan. When it drips, it’s perfect. When it is still too liquid, cook it again 1-2 minutes. Don’t worry! I reheated my very first caramel 3 times!!! until it had the right consistency. I was too afraid that I cook it too long and it gets too firm. In case it is too firm, you could rescue it by adding 1-2 tablespoons of heavy cream. When it has the right consistency, scoop out 1/2 cup and transfer to a bowl. You need this for the buttercream. Let the caramel in the bowl come to room temperature. Cover the caramel in the saucepan and let stand a few hours. For the filling you need apples, peel and dice them. I needed exactly 3 fist-sized apples to get 2+1/2 cups of peeled and diced apples. The measuring of 2+1/2 cups relies on the apples when they are already peeled and diced. Place apples, sugar, cinnamon, freshly squeezed lemon juice, and butter in a small saucepan and cook over medium heat about 10 minutes until the apples are soft. Set aside and let come to room temperature. I’m sure that you love how your house smells right now. All that apple, cinnamon, and caramel smells are so awesome and will make you craving this Caramel Apple Cake so bad! Super moist and soft apple cake. You’re going to love this apple cake! It is so tasty that you can eat it without anything. The cake is easy to make. Combine the flour, baking powder, salt, and cinnamon. Then mix oil and sugar until well combined. Add unsweetened applesauce and vanilla. Then eggs. At the end stir in dry ingredients and divide into two baking pans equally. I always line my baking pans with parchment paper by cutting out circles for the bottoms and stips for the sides of the pan. This makes it super easy to remove the cake from the pan. 1+1/2 tsp cinnamon and 3/4 cup unsweetened applesauce make the cake unbelievably tasty. After it is cooled, cut off the tops to create an even surface. Then cut the cakes in half horizontally. You have now 4 layers of apple cake. And yes, please, please eat the tops. NOW. So, we arrived almost at the end. We need just the caramel buttercream. Then we have all the parts for our amazing Caramel Apple Cake. Mix butter until very, very soft and creamy. This is the key to super creamy buttercream. Then sift in powdered sugar and whisk until well combined. Add vanilla and stir to combine. Then stir in the 1/2 cup of caramel sauce what we’ve transferred to the bowl earlier. Stir until very creamy. The caramel buttercream should be very creamy but firm enough to spread. If it is too soft, add a bit more powdered sugar. If it is too firm, add 1 tbsp of heavy cream. Now let’s assemble the cake. 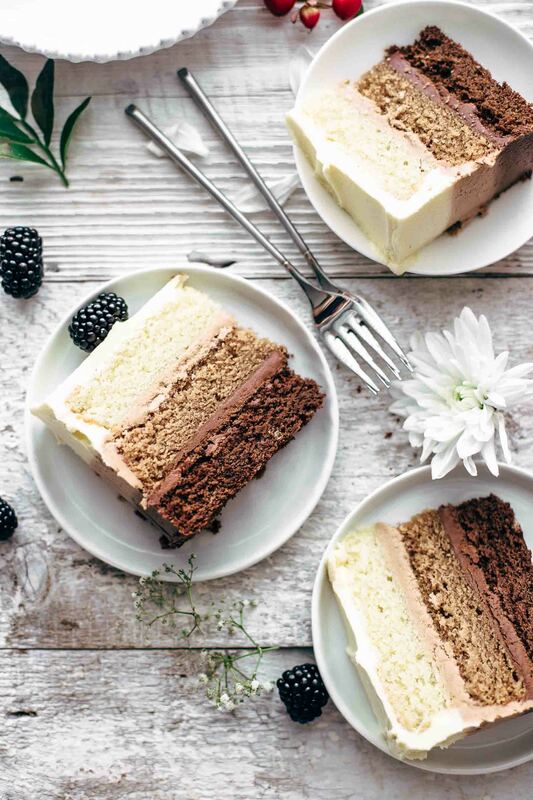 Place the first cake layer on a cake turner, stand, or serving plate. Then spread 1/4 of the buttercream on top. Make sure that the frosting around the edges is higher than in the middle. This holds the apple filling inside the cake. Place 1/3 of the apple filling without any liquid on top of the buttercream where the cream is lower. Repeat with 2nd and 3rd cake layer. Place the 4th cake layer on top and frost the top and the sides with the remaining 1/4 of the buttercream. The buttercream is just enough to make a naked cake. Place in the fridge for at least 3 hours preferably overnight. After chilling warm up the caramel that it is hand warm by placing the saucepan over low heat for about 1 minute. This makes the caramel fluid and shiny. Then pour caramel in a multi-cup glass measuring cup. Push stick(s) inside the top of the apple(s) and dip it/them into the caramel. Place on a paper layered baking sheet. You can sprinkle the apple(s)with nuts if desired. Or drizzle with chocolate. Also delicious! Slowly pour the remaining caramel on top of the cake. Start in the center and move the cup like a spiral outwards to the edges of the cake and let drip down the sides. Place apple(s) on top of the cake and sprinkle with even more nuts if desired. Watch also the 90 seconds video to see every step. 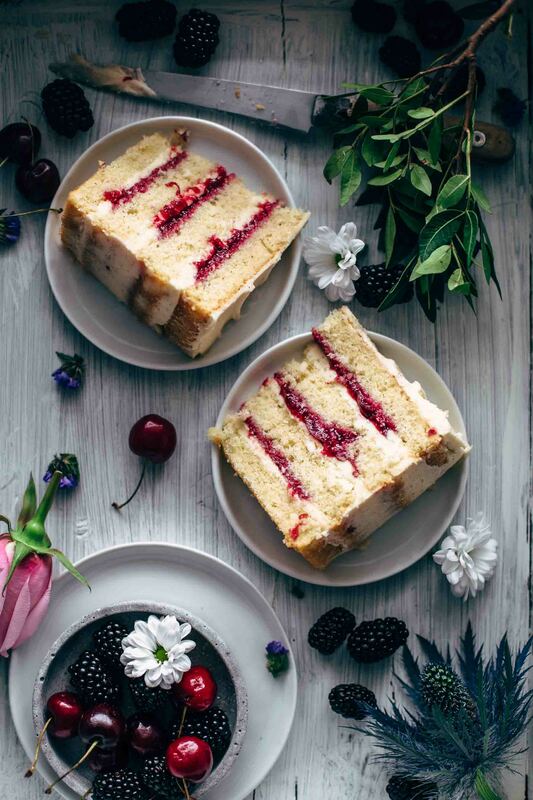 It’s definitely not the quickest cake to make but once you take the first bite, you know that it was worth every single minute! If you make this Caramel Apple Cake recipe, leave a comment, rate it and tag a photo #alsothecrumbsplease on Instagram! Would love to see your snap! 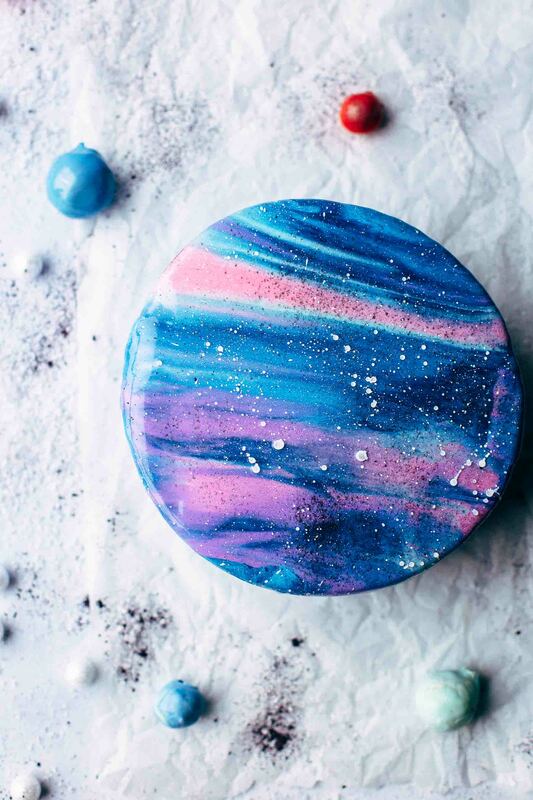 You may also like Triple Chocolate Ombré Cake, Fresh Cherry Cake Recipe From Scratch, Mirror Glaze Galaxy Cake Recipe, How to make a Rainbow Cake or click here to see all recipes. Caramel sauce: In a small saucepan, combine butter, brown sugar, heavy cream, salt, and honey and bring over medium heat to a boil. Cook for about 10 minutes until it has thickened up and coats the back of a spoon but is still liquid. Whisk continuously. Test the caramel down the side of the saucepan to get the right thickness. The caramel should be thick enough to drip and doesn't run down like water. But don't cook it too long that it is not too stiff to pour it on top of the cake when it is cool. The caramel will thicken as it cools. Remove saucepan from the heat. With a heatproof cup scoop out 1/2 cup of caramel sauce and transfer to a small bowl and let cool to room temperature (you need this for the buttercream later). Cover saucepan and let stand overnight at room temperature until your cake is ready for decoration. Read the blog post above about cooking caramel. Also, watch 90 sec. video. Apple filling: Place all ingredients in a large saucepan and bring over medium heat to a boil. Cook for 8-10 minutes until the apples are soft. Stir constantly. Remove from heat and let cool to room temperature. Apple cake: In a medium bowl combine flour, baking powder, cinnamon, and salt and stir to combine. Set aside. In a large mixing bowl with a stand or handheld mixer fitted with a whisk or paddle attachment, beat oil and sugar until well combined for about 2 minutes. Add applesauce and vanilla* and stir until combined. Add eggs and mix until fully incorporated. Stir in dry ingredients just until combined. Divide batter into the two prepared baking pans equally. Bake for 18-22 minutes or until a toothpick in the center comes out clean. Don't overbake. Let cool to room temperature. Caramel buttercream frosting: In a large mixing bowl beat butter on medium speed until super creamy, about 2-3 minutes. Sift in powdered sugar and whisk until the sugar is dissolved. Stir in vanilla*. Add 1/2 cup cooled caramel sauce and stir until super creamy. If the buttercream is too firm, you can add 1 tbsp heavy cream to lighten it up. If it is too creamy to spread on the cake, add more powdered sugar to thicken it up. The buttercream should be creamy and fluffy but firm enough to spread. Assemble the cake: Cut a thin layer off the tops of your cakes to create a flat surface. Then cut each cake in half horizontally. Place one cake layer on a cake stand, turner or serving plate. Spread 1/4 of the buttercream over the cake. The buttercream should be higher around the edges that it holds the apple filling inside the cake (watch the video for better understanding). Layer with 1/3 of the apple filling without any liquid (where the buttercream is lower). Repeat two more times. Place last cake layer on top and lightly frost the outside and the sides of the cake with the remaining frosting. Chill at least 3 hours in the fridge or overnight. Heat caramel on low heat that it is lukewarm. Transfer to a multi-cup glass measuring cup. Let stand a few minutes until the caramel is hand warm. The caramel should be thick but still pourable. While the caramel stands, push stick(s) into the tops of the apple(s). Then dip apple(s) into caramel and place on a parchment paper layered baking sheet. Sprinkle apple(s) with nuts if desired. Slowly pour the remaining caramel on top of the cake. Start in the center and move the cup like a spiral outwards to the edges of the cake and let drip off the sides. Watch 90 seconds video for better understanding. Place apple(s) on top of the cake and sprinkle with nuts if desired. Place cake in the fridge for 15 minutes that the caramel gets firm if needed. Store leftovers in an airtight container in the fridge up to 3 days. Leftover slices are best eaten when you let them sit at room temperature for 15 minutes before serving. Thanks for the recipe! I made it this Thanksgiving. The apple filling is fantastic! I made a little more of the buttercream frosting and added a splash of lemon juice to cut the sweetness with a bit of acid. It was lovely. I don’t think the cake has the right ratio of dry ingredients to wet ones – the cake batter itself came out closet to a cookie dough and it was pretty dry and dense once baked. I think I will use a favorite spice cake recipe replacing the butter for the applesauce if I make it again. I’m happy that you like the filling and yes, that’s a great idea when using more buttercream to cut down the sweetness. The cake has the correct ratio of dry to wet ingredients. A cake can get dry for many reasons like overmixing or overbaking etc. But from what you say it sounds to me that in your case was really too much of dry ingredients in the batter. There can be just two reasons for that: 1. Maybe there was a wet ingredient forgotten, or the eggs had the wrong size (they need to be large). Did you add 1 cup of oil and 3/4 cup of applesauce? 2. The flour was not spooned and leveled. When using flour in baking, please make sure to spoon and level the flour into the measuring cup. When you pack the flour into the cup, then you easily end up with 4 cups instead of 3 cups of flour, and this causes a completely different texture. The unbaked batter needs to be thick but liquid to pour it into the pans. You can see the consistency of the cake batter in the second photo but also in the video (there you see how it looks like when I pour it into the pans). Hope that helps, otherwise please reach out to me again to figure out what was the problem. Have a great day! Awesome, thanks! I’ll look out closely for those things next time. Potentially the egg size was the main factor here! Glad for the extra suggestions..